Composed by Isaac Albeniz (1860-1909). Masterworks; Piano Collection. Dover Edition. Classical Period. Collection. With standard notation, fingerings and introductory text (does not include words to the songs). 186 pages. Dover Publications #06-253678. Published by Dover Publications (AP.6-253678). ISBN 0486253678. 9x12 inches. English. 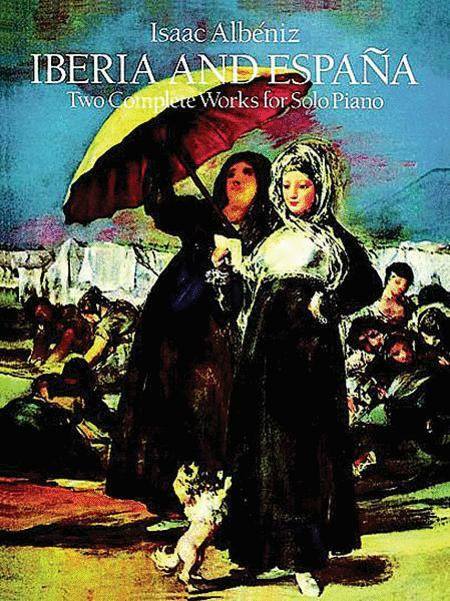 The great Spanish composerÕs best-known piano compositions, in authoritative editions. The often-performed Iberia contains 12 musical scenes of Spanish life and reflects the rhythms and harmonies of Spanish popular music. Espana contains 6 works, among them the famous "Tango." Table of Contents. , Capricho Catalan, and Zortzico. Delightful all. Spanish impresionism is by far the most colorful musical language ever created and Albeniz is it's topmost advocate. Excellent edition. 19 of 40 people found this review helpful. What a magnificent collection of music for piano and some of the most difficult I've tackled. Some of the pieces are certainly beyond "advanced" and qualify as "virtuoso" level.